Zephaniah is listed in the 1860 census for Equality, Gallatin County, Illinois6 under his father, George Phillips and his father’s wife, Catherine Molsbee Wallace.7 Zephaniah is 23 years old at the time of the census and no occupation is listed. In the census records, in the county history, and in his pension applications Zephaniah is listed as an inventor, mechanic, wagon or carriage maker, cabinet maker, and real estate agent. In the county history, he is said to have started a grocery store in Harrisburg after the Civil War. Also, when he was young, he learned and practiced the blacksmith trade. He invented many items, and secured many patents, including the Phillips Burglar Proof time safe. 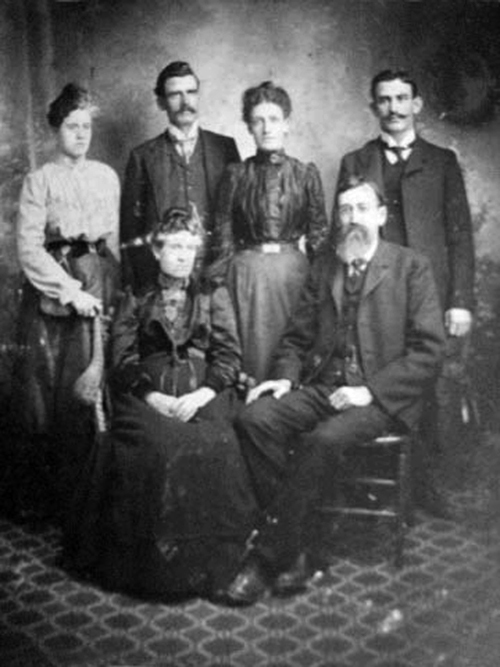 Photograph above is of The Zephaniah Phillips family. Sitting: Mary Pierce Phillips, daughter of Jarvis Pierce, Jr. and Elewisa A.R. Hubbard; and Zephaniah Phillips, son of George W. Phillips; standing, L-R: Note on photograph says Flora, but this may be Anna Phillips, the oldest child; Zephaniah Jr.; Julia Jeanettie; and Clarence Phillips. Copy of photograph from Dixie Phillips Pernell, great granddaughter of Zephaniah and Mary Pierce Phillips and the granddaughter of Zephaniah Jr.
Pinellas County, Florida, Cemeteries. Greenwood Cemetery, St. Petersburg. Inscriptions. Family History Center Microfilm #869287. Date of birth on Zephaniah Phillips’ gravestone is Mar 2, 1837. Grismer, Karl H. History of Saint Petersburg, Historical and Biographical. St. Petersburg, Florida, Tourist News Publishing Co., 1924. Biographical sketch states that he was born in Toronto, Canada, on March 2, 1837, and that he came to the United States when he was two years old. 1900 U.S. Census. Florida, Hillsborough County, St. Petersburg. Precinct #1, house #131, p.5B. 1880 U.S. Census. Arkansas, Independence County, Ruddell Township, Batesville. Family #164, p.18. In the 1860 U.S. Census his birthplace is given as Rhode Island also; in the 1870 U.S. Census his birthplace is given as New York. In Grismer's History of Saint Petersburg he is said to have come to the United States when he was two, but I have not located George phillips and family in the 1840 and 1850 censuses in Illinois. 1860 U.S. Census. Illinois, Gallatin County, Equality, p.8. Catherine was not Zephaniah's mother. According to unverified information from other sources, Catherine and George were married sometime between 1847 and 1850. Catherine is not listed in the 1870 census with George. National Archives. Military records of Zephaniah Phillips. Saline County, Illinois, Marriage Records, Vol. A, C-D, 1855-1880. Marriage record is in Vol. A, p.37. Family History Center Microfilm #0965056. Mary was very young when she married Zephaniah. She was not quite fifteen at the time. Directory of American Tool and machinery Patents. The patent number was 102966. A photograph of the plane can be found at the D'Elia Antique Tool Museum of Scotland Connecticut. 1870 U.S. Census. Illinois, Lee County, Dixon. 1st Ward, p.16, line 23, dwelling #107, family #133. Date of census was 6 June 1870. Although Julia's death certificate gives her place of birth as Paducah, Kentucky, Bea Whitted, wife of Julia's son, George Whitted, wrote that Julia was born in Dixon, Illinois. The 1880 and 1900 U.S. Censuses and the 1885 Florida Census list her place of birth as Illinois. Improvement in Time-Locks, Zephaniah Phillips, Patent 183966, Google Patents database. National Archives, Military Records for Zephaniah Phillips. Pension Application of Zephaniah Phillips, Washington, D.C., Dept. of the Interior, Bureau of Pensions, 1898. Application lists names of children and birthdates, but not places of birth. 1885 State Census. Florida, p.38, June 30, 1885, Family number 389; Clarence E., age 10, born Ohio. FHL MF 0888969. Record of death: Ida May Phillips, d.1880, Ohio County, West Virginia, Records of Death, Wheeling, West Virginia; accessed at website of West Virginia Division of Culture and History: http://www.wvculture.org/vrr/va_dcsearch.aspx , p.122, Ida May died 6 Aug 1880 in Wheeling, WV, of what appears to be Marasmus, a wasting away, similar to malnutrition. Burial was in East Wheeling. Declaration for Original Invalid Pension, made by Zephaniah Phillips before a clerk of the court, County of Ohio, State of West Virginia, 12 May 1879. At the time, Zephaniah was a resident of Bridgeport, Belmont County, Ohio, and claiming a pension for disabilities received during the Civil War. 1880 U.S. Census. West Virginia, Ohio County, Wheeling. 5th Ward, p.314, Dwelling #6, Family #6. The address on the census sheet looks like 1919 Main. St. According to the biographical sketch by Grismer in the County History, thee family went to Florida for Zephaniah's health. Northeast of Gainesville in northern Florida. Florida Historic Site Marker, Pass-a-Grille, Florida. Death Certificate for Zephaniah Phillips. State of Florida, Department of Health and Rehabilitative Services, State Board of Health, Bureau of Vital Statistics, Jacksonville. He died 21 January 1903, St. Petersburg, Hillsborough County. Bright's disease was chronic inflammatory kidney disease. Zephaniah and Mary were living at 131 5th Avenue in the 1900 census, but no residential address was given on Zephaniah's death certificate. Greenwood Cemetery Inscriptions, St. Petersburg, Pinellas County, Florida. Family History Library Microfilm #869287. Gravestone of Zephaniah Phillips. Greenwood (now Roser Park) Cemetery, St. Petersburg, Florida. 1920 U.S. Census. Florida, Pinellas County, St. Petersburg. Precinct 7, p.31A, line 44. Family History Center microfilm #1820229. Mary, age 72, was head of household. Death Certificate for Mary E. [Pierce] Phillips. Florida, State Board of Health, Bureau of Vital Statistics, State File #1410, registered #34. At the time of her death her residence was 5219 4th Avenue So., St. Petersburg. It is more likely that her age was 80, not 84. In the 1870 census she was 22; in the 1880 census she was 32; in the 1885 census she was 38; in the 1900 census she was 52; in the 1920 census she was 72. She would have turned 81 in November 1929, but she died in January. No gravestone was found for Mary when we searched the cemetery in October 2004. Civil War Discharges - Franklin County, Illinois, compiled by Carla Pulliam, c.1999. There is a Lincoln, Ontario, Canada, just south of Toronto, not far from Niagara Falls. Photographs and web page content,Copyright © 2002, Anne Field, all rights reserved.